The twelfth century in Europe has long been acknowledged as a time of spiritual and intellectual vitality, a period that laid many of the foundations for the subsequent flowering of European thought and civilization. A number of researchers, however, have begun to argue that this "twelfth-century renaisssance" had a dark side, that it saw the emergence of wide-ranging hostility toward outgroups that has plagued the Western world ever since. Among these outgroups, the Jews occupied a place of unfortunate prominence.Prior to the tenth century, there was little permanent Jewish presence in the northern areas of Europe. The vitalization of this heretofore backward area attracted Jewish settlers, who found their niches in the growing towns of the north, made a considerable contribution to the burgeoning economy, and aroused considerable antipathy. This antipathy was rooted in part in the actual circumstances of the Jews--their immigrant status, their religious dissent, their economic activity, and their political alliance with the authorities; it was in part the result of traditional Christian imagery of the Jewish enemy. During the twelfth century, this hostility deepened significantly, as a result of changes in Jewish economic activity and political status and of deepening anxieties within the Christian majority. Jews were now viewed as steeped in radical animosity toward their Christian neighbors, poised to inflict economic, social, and even physical harm. The most telling new stereotype projected Jews as murderers, ever ready to take the lives of unsuspecting Christian victims.Eventually, the new and potent anti-Jewish sterotypes took a toll on the Jews of northern Europe by widening the gulf between them and their Christian neighbors. The Roman Catholic Church, long committed to a dual policy of protection of Jewish rights and limitations on potentially harmful Jewish behaviors, was moved by the new twelfth-century views to emphasize increasingly the need for restrictions on Europe's Jews. The royal and baronial patrons of the Jews were eventually led by a combination of social and ecclesiastical pressure, personal cupidity, and genuine conviction to abandon the prior policy of protecting and supporting their Jewish clients. 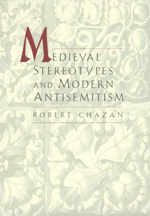 Thus, during the thirteenth century the innovative stereotypes slowly undermined the Jewish position in northern European society, leading over time to the removal of the Jews from the western sectors of northern Europe, to the decline of Jewish life in the central sectors of the north, and to the creation of new areas of Jewish settlement in late-developing eastern Europe.Long after these changes, the twelfth-century imagery of the pernicious Jew continued to plague Jewish life throughout the Western world. Much of modern antisemitic thinking is rooted in the twelfth-century perception of Jews a malevolent force within Christian society. To be sure, developments within modern Western societies produced new stereotypes and allegations; however, the twelfth-century sense of Jewish malevolence and harmfulness undergirded much of this modern imagery. Thus, a period justly recognized for its creative contributions to Western civilization left a legacy of hatred and persecution as well. The twelfth century in Europe, hailed by historians as a time of intellectual and spiritual vitality, had a dark side. As Robert Chazan points out, the marginalization of minorities emerged during the "twelfth-century renaissance" as part of a growing pattern of persecution, and among those stigmatized the Jews figured prominently. The migration of Jews to northern Europe in the late tenth century led to the development of a new set of Jewish communities. This northern Jewry prospered, only to decline sharply two centuries later. Chazan locates the cause of the decline primarily in the creation of new, negative images of Jews. He shows how these damaging twelfth-century stereotypes developed and goes on to chart the powerful, lasting role of the new anti-Jewish imagery in the historical development of antisemitism. This coupling of the twelfth century's notable intellectual bequests to the growth of Western civilization with its legacy of virulent anti-Jewish motifs offers an important new key to understanding modern antisemitism. Robert Chazan is Scheuer Professor of Hebrew and Judaic Studies at New York University. His previous books include Barcelona and Beyond: The Disputation of 1263 and Its Aftermath (1992), Daggers of Faith: Thirteenth-Century Christian Missionizing and Jewish Response (1989), and European Jewry and the First Crusade (1987), all published by California.